Viking ace Jeff Wildung in the No. 50 Veit Companies Rocket charged from the ninth starting spot to finish second, with Brad Seng, driver of the No. 12S S&S Transport Mars MB Custom close behind in third. Dustin Strand, driver of the No. 71S Q&Z Plumbing & Heating Millenium kicked off his title defense with a fourth place finish after starting 14th, and was followed to the line by Mike Balcaen, driver of the No. 10 Northstar Canada Victory Circle, who rounded out the top five. Brad Seng took the lead on lap five, and denied Ricky Weiss of a weekend sweep by collecting his 21st series victory on night two of the Memorial Day twin-bill. Weiss became the second driver on the weekend to finish second from the ninth spot, equaling Jeff Wildung's feat from the night before. Donny Schatz and Eric Breeschoten were third and fourth respectively, while Pat Doar rounded out the top five after starting 16th. The hard chargers were Zach Johnson, driver of the No. 73 of the Midwest Grain Systems Pierce on Saturday and rookie Dustin Bluhm on Sunday, each passing 16 cars. Last years' labor day double was shortened to a one day show after a severe thunderstorm, and subsequent downpour ended night one just before it started during the five o'clock hour. Zach Johnson came back the following evening to take home the 44 lap main event. The win was his third NLRA series victory to fall on September 1 at Alexandria. Johnson has won six times on labor day weekend at the Viking Speedway. Brad Seng leads the NLRA point standings heading into the weekend with a 118 point advantage over Mike Balcaen. Dustin Strand sits in the third spot, while Shane Edginton, driver of the No. 5E Avonlea Group Victory Circle and Cole Schill, driver of the No. 44 Rivinius Ranch Rocket round out the top five. Ricky Weiss is in the sixth spot, with Steve Anderson, driver of the No. 9 Hi-Per-Flex Panel Systems Pierce in seventh, Bill Mooney, driver of the No. 2 Lithita Toyota/Pizza Ranch Rocket eighth, Donny Schatz ninth, and Pat Doar rounding out the top ten. After the heat races and redraw were completed on Thursday night at the Norman County Raceway, rain moved in and claimed the rest of the evenings action. 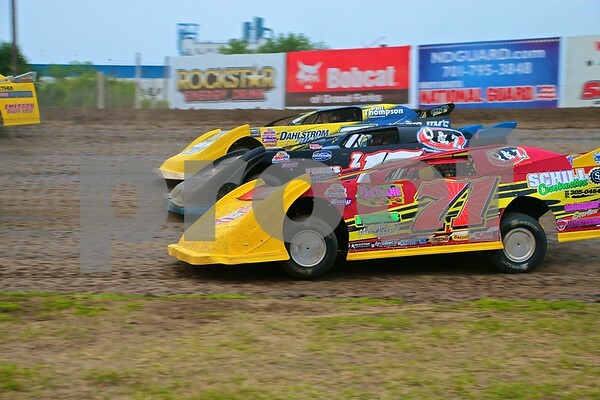 On Saturday night, the series was scheduled to race for the second time this season at the Devils Lake Speedway, but the race was cancelled just after six o'clock, completing the weeks' washout. These races were the sixth and seventh cancellations of the season, and join rain outs at the Greenbush Race Park (June 14 & July 12), Buffalo River Race Park, near Glyndon, MN (June 15), I-94 Speedway in Fergus Falls, MN (June 27), and the Viking Speedway (June 28). Many NLRA series regulars also lost their chance at completing their regular race night on Friday at River Cities Speedway as well, as the track weathered three rain delays, but were forced to postpone the feature until the following Friday due to the curfew with the city. Dustin Strand (71), Zach Naastad (Z17), and Joey Pederson (7P) racing three wide at the River Cities Speedway on August 16th. Photo courtesy of Rick Rea.